« If you are reading this you’re bio curious. The user experience of buying Twitter followers. And definitely not (ever) for a client. They were for a friend. A joke Secret Santa present. Obviously in the real, professional, non-Secret-Santa world, this would be an unethical, sleazy, underhand, social media no no. But, that aside, I have to say that the purchase experience and customer service I received were both very good. 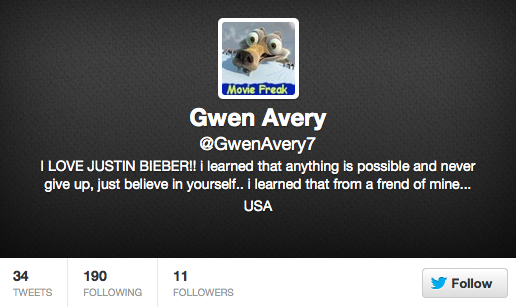 After a bit of online research I bought the followers from an American site called Fan Me Now. Whilst there is little to commend the act of buying Twitter followers, there was actually much to commend the way that this site sells them. You know where you stand with Fan Me Now. It is made very clear that the followers you’re buying are not real, even if care has been taken to make them look real. At first glance at least. As the disclaimer says, they also offer a “real”, “targeted” follower package. But you need the recipient’s Twitter password for that service. I was wary about spending money with people who sell fans and followers. But every interaction with Fan Me Now left me more and more reassured. The up front (brazenly) transparent disclaimer helped. But so did the speed and tone of each pre-purchase interaction. There is a live chat option if you have questions whilst browsing the site. But I opted for email, and asked about the time between purchase and “delivery” for something as time sensitive as a Secret Santa present. I received a prompt, polite reply. They clearly got what I was trying to achieve and recommended a two day lead time to be safe. Despite the encouraging body language coming from Fan Me Now I think I would have baulked at entering credit card details directly into their site. Not worth the risk for a joke project. But the money is handled by proxy through Paypal, which removed a potential barrier. Prices start at $10 for a 1,000 followers. And go all the way up to $1,750 for a million. Our official Secret Santa spend limit was £10 and so I went for the 5,000 follower option at $35. I figured that the extra impact of the additional 4,000 followers would be worth being a little extra out of pocket. I had been promised 5,000 followers (for my colleague) within 48 hours. I (she) actually received 5,310 followers within 24 hours. In fact it was all over very quickly. Once “it” started I watched Deana‘s following grow by over 5,000 in the space of about 80 minutes. And she quickly sussed what was happening. (But not who was behind it). As was made very clear from the outset, these 5,310 followers were not real. Other than (possibly) making someone look more popular or more influential at first glance, they are useless. But for my purposes they were perfect. Not only delivered ahead of time, but also delivering comedy value. If you know Deana, you’ll know that the following sample of three followers are not exactly her type. So, from my perspective, Fan Me Now did a very bad thing very well. But the acid test of any customer service operation is how they deal with returns. The Christmas jumper that doesn’t fit or doesn’t suit. Or both. The book or DVD that you’ve already got. 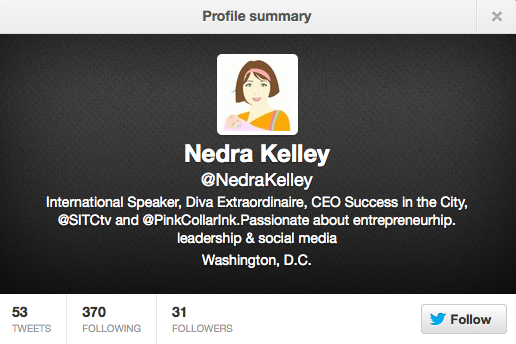 The highly professional community manager who finds herself with a fake Twitter following.